2016 marks the 27th annual Thunder Over Louisville. Each year has a theme, the 2016 Thunder Over Louisville theme: No Strings Attached. Will there be music for Thunder Over Louisville? Of course! Aside from fireworks, an air show and the fairgrounds along the Ohio River, music is what comes to mind when many people think of Thunder Over Louisville. 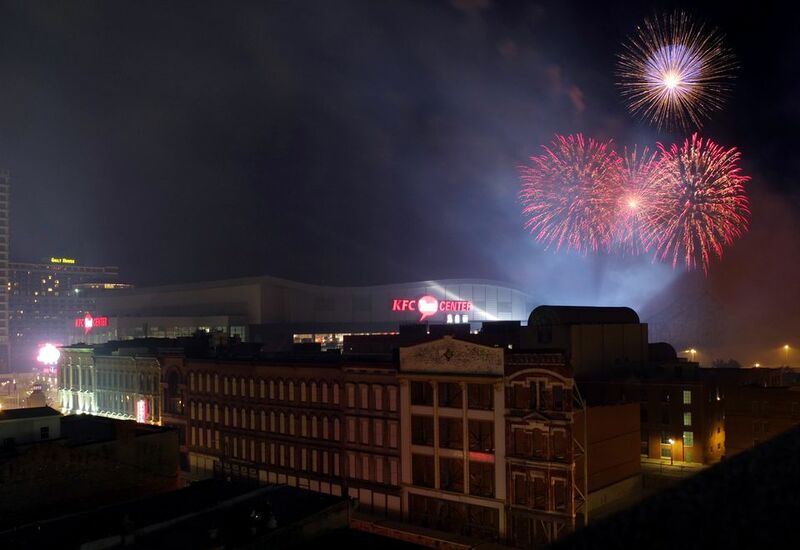 For 2016, The Kentucky Derby Festival—which coordinates and organizes Thunder Over Louisville—has the Louisville Orchestra providing the soundtrack for the fireworks show. The music will be fresh and new, premiering during Thunder. The organization has shared that some of the songs will be familiar, though. Hit tunes from popular artists such as My Morning Jacket, Katy Perry, Michael Jackson and Metallica will be included. Isn't My Morning Jacket from Louisville? Yes! My Morning Jacket is a rock band from Louisville. The lead vocalist and guitarist, Jim James, is a local celebrity. (Well, all of My Morning Jacket is, but Jim James is pointed out more frequently) The band also works with local artists. For instance, when they perform live, they are known for using large scale puppets made by the Louisville puppet group Squallis Puppeteers. The band formed in 1998 and are still releasing albums. Why does Thunder Over Louisville happen every April? Ok, don't ask this question in public! But here's the skinny: Thunder Over Louisville is the official launch of Derby season. What is Derby season? Derby season is the weeks of events leading up to the Kentucky Derby. The events are put together by the Kentucky Derby Festival and there are plenty of private events and parties that happen, too. Most festival events are free with a Pegasus Pin and if you are looking for an event outside of the Kentucky Derby Festival offerings, check out the Cherokee Triangle Art Fair. Of course, some people like to think of Thunder as something separate from Derby, that the festivities of the day and the colorful sky at night are simply a fabulous way to celebrate the beginning of spring. Is there an airshow planned for 2016? Yes! Of course! There will be a fabulous air show during daylight hours over downtown Louisville. The aircrafts will fly and do stunts over the Ohio River and the surrounding waterfront property. Included flyers are the U.S. Navy parachute team, the Leap Frogs, the Trojan Horsemen T-28 demo team, and many more. When is Thunder Over Louisville 2016? Since Derby is always the first Saturday in May, Thunder Over Louisville always falls in April. In 2016, Thunder Over Louisville is Saturday, April 23. There will be things to all day, but the planes will start flying around 3 p.m. and entertain crowds throughout the afternoon. The fireworks don't start until it is dark, after all of the planes are safe and out of the sky. The plan is for the fireworks to follow the airshow at 9:30 p.m. If you are attending the event, know that it is a tradition for many families to spend the whole day downtown. So, it can be difficult to get in and out of downtown. Be prepared to park for the day, and pack a bag with what you will need as you may need to park far away from the event. It's smart to bring a warmer clothes layer because it gets colder and night along with sunglasses and sunscreen to get you through the heat of the day. Is there food at Thunder? There are plenty of places to get food along and near the waterfront. Restaurants along Main Street are open throughout the day and the Thunder Chow Wagon is an outdoor market (of sorts) where you can purchase fair food like BBQ pulled pork, roasted chicken, brisket with Derby sauce, rib eye sandwiches, gyros, kabobs, Italian meatball subs, funnel cakes, ice cream, fried candy bars, strawberry shortcake, fresh lemonade, fajitas, frozen daiquiris, frozen margaritas, corn dogs, sausages, Philly cheese steak, hamburgers and more. There is often live music and the attraction is near the carnival rides, too.